We have sold multiple horses over the years since we have been in the breeding business for the last 30 years although we only breed a few selected foals each year. We are proud of the standard that we have set and the “name” that we have put out there. 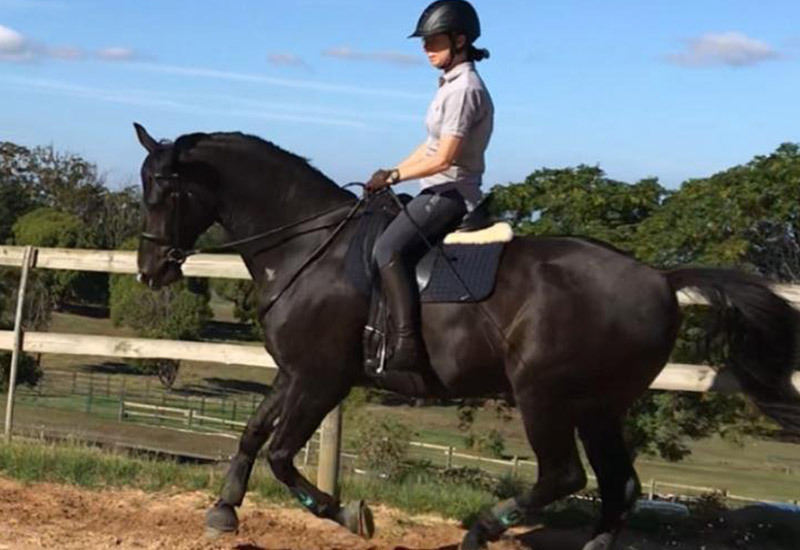 Horses are matched with owners and as our knowledge grew within the industry we realised for the ultimate success rate you need to match horse and owner efficiently. This takes time not money, a thorough understanding of the horse and its required potential “person”, and analytical skills with lots of patience. Only then the horse and owner together can thrive to be a successful team. We walk the road with our clients, might it be gravel or paved. Every horse has a “special” person and thus we do not retain horses on a permanent basis, only until he or she has found their person. However until that time we provide each and every horse with the same level of quality in terms of management, training and schooling. Every horse goes through a consistent stud system which enables them to become the best they can. 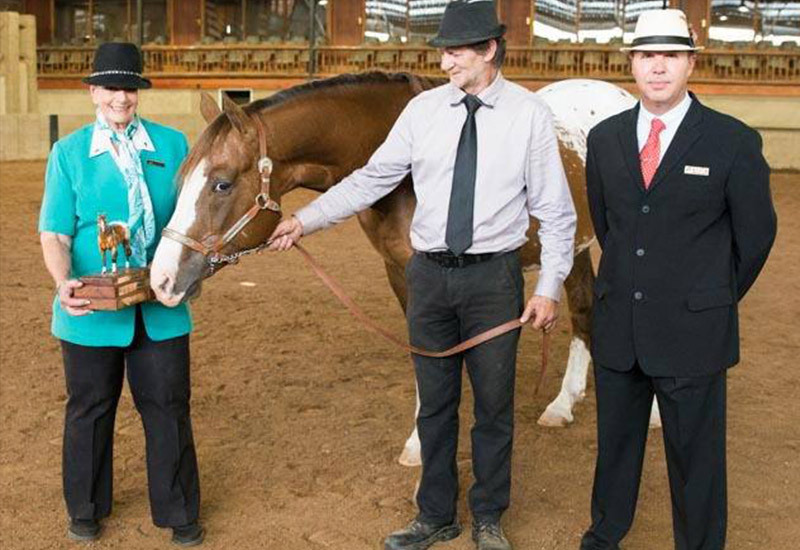 The stud’s support system reaches far with some of the most well-known breeders, riders, trainers and instructors. Certain set factors determine the price of the individual horse raised in our specific expertise management system which is always within reason. We have done the intense selection and we guarantee a good healthy individual that is hardy, sensible, talented and beautiful absolutely unique to the horse world. 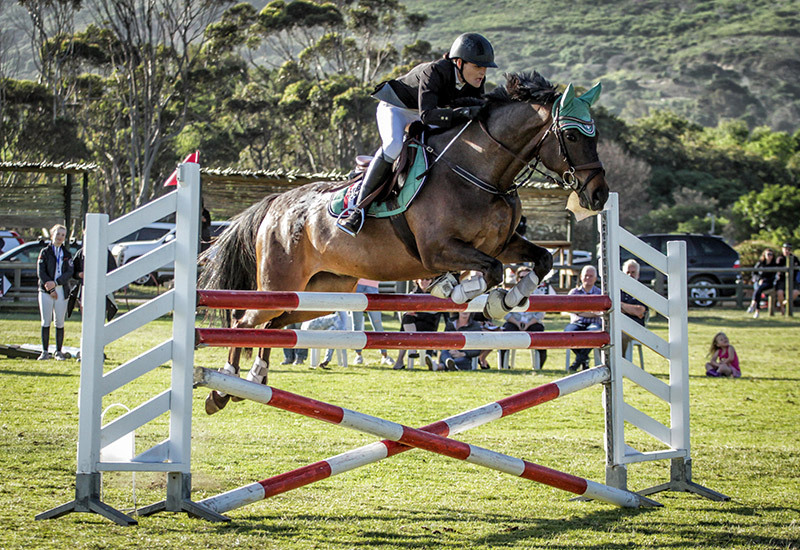 ludorum winners for the NRA (Noordhoek Riding Club) Anual club Awards for 2017* Finished the year with Enough points to be graded and Compete in 1.10m. 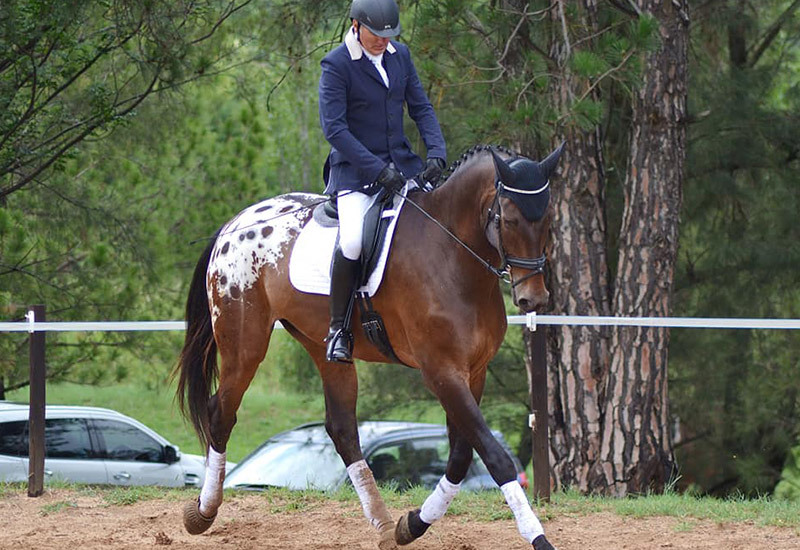 Painted A Grand Illusion in action at the 1st Champagne Tour Dressage show over the weekend. He was AWESOMELY AMAZING!!! So very in love with this gentle giant. Xubeshonge stud’s stallion and 2018 champion appaloosa sport horse stallion. Standing at 16.3hands with a puppy temperament. 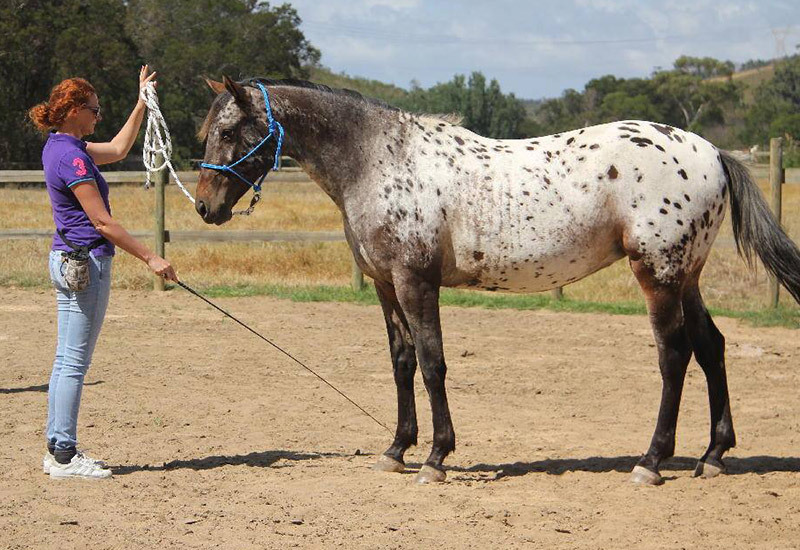 He is out of one of our homebred mares, Painted Summer Rain by the imported appaloosa stallion Peyers Executive Rock. We received this lovely photo from Painted Limelight’s owner whom is super impressed with her young appaloosa sport horse mare! She received a second place for her dressage with scores as high as 7! Well done!! As a small stud whom only breeds 2 to 3 foals every second year it has proven to work. We have a 100% success rate and the unique genetic composition of our horses is only part of the winning recipe. Satisfaction for us is not obtained by selecting an individual out of a large group of foals, but to rather plan each breeding so carefully and provide each individual with a consistent environment that we can guarantee that youngster to his new potential owner. Support good ethical breeding not numbers. Quadroon is taking the Wesetrn Cape showing by storm. He is placing in the top 3 at every show that he has entered so far! 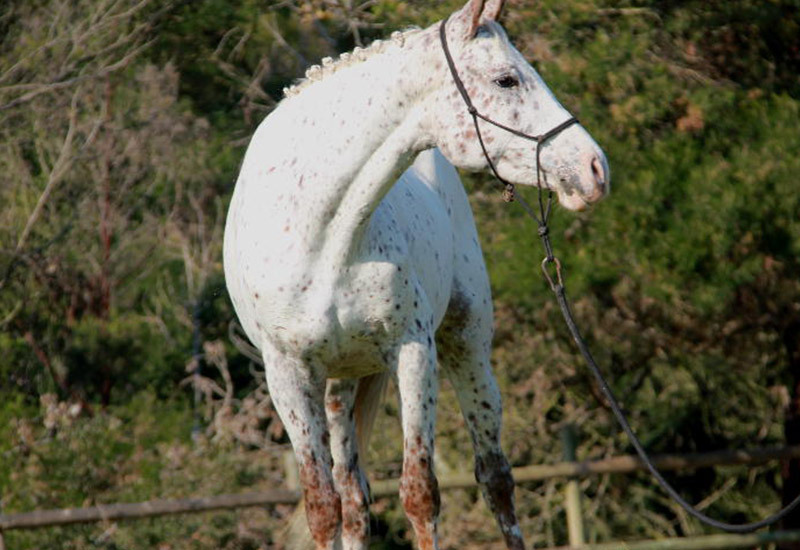 Brilliant promotion for the stud ad for a purebred appaloosa standing just short of 17hands at the age of 3. His owner has the following comments: Quadroon is such a pleasure ! To have ! To train! Thanx again for trusting us with this special boy. 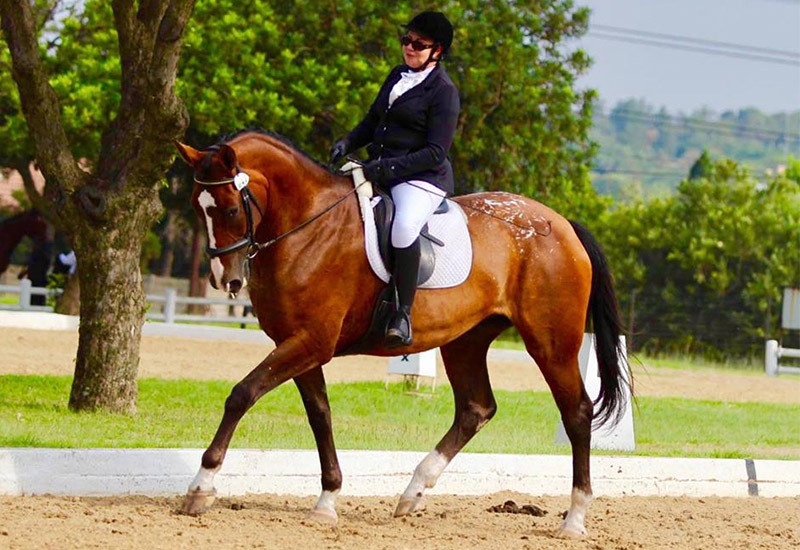 What his rider had to say after their first official dressage test: Helios achieved 75.31 and 75.62 % at his first show. Granted, it wasn’t a prix st George test, but the wind was horrid and we had two trains come past (real trains, the venue borders on the railway line) and the CHAMP didn’t put a hoof out of line. Emma and Flash were lying seventh out of nearly 100 competitors on day one after the dressage with 31.9 penalties. Day two they were clear over the cross country and maintained there position and toady after the show jumping she won her class also won best overall adult of the whole show and had the least penalties out of everyone at the show. That includes the teams from Namibia and South Africa aswell as all the Zimbabwean riders”. How about that!! I am so so proud! Thank you to his kind loving owners. Time to Shine is our glitz and glam girl. 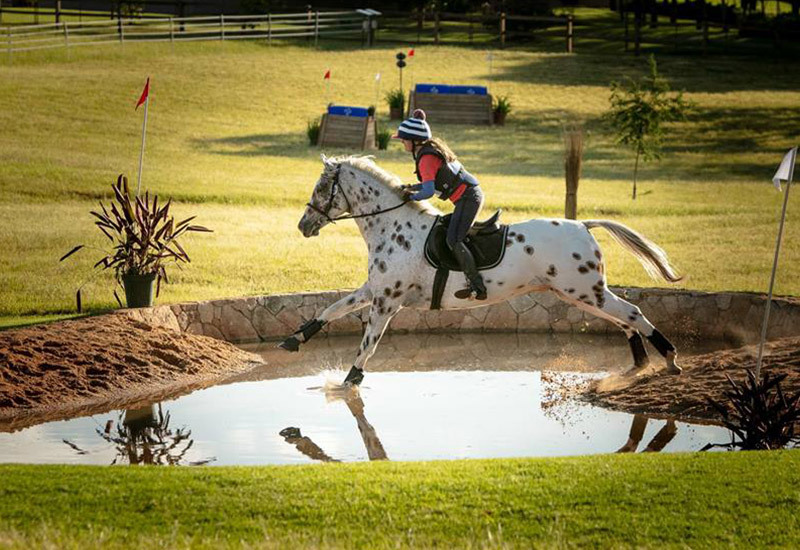 She is a tall modern purebred appaloosa living the high life up country being ridden with top showjumpers and being instructed by some of the best in this country. 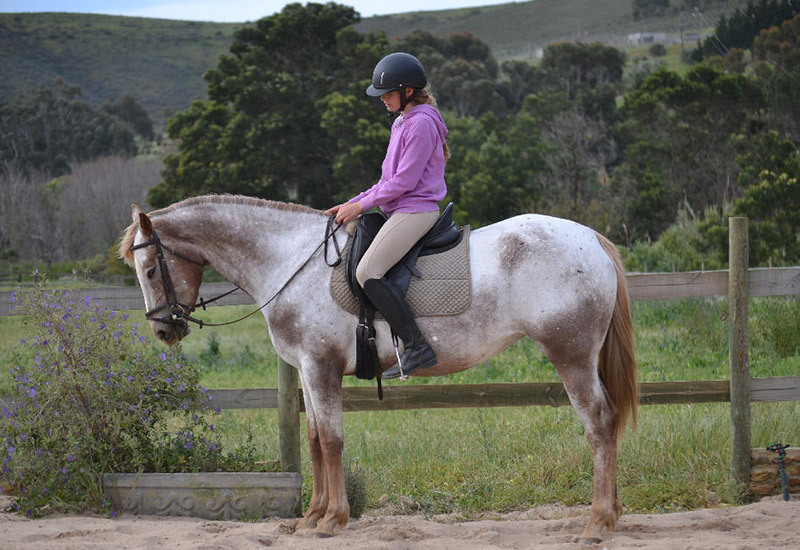 An elegant appaloosa sport horse gelding will be soon seen the dressage circuit. His owner is making sure he is ready in both mind and body before taking out the big guns! Hello just a little update on Goldie – we competed at Nationals a few weeks ago and he was so amazing, we got a 1st and 2nd for teams! 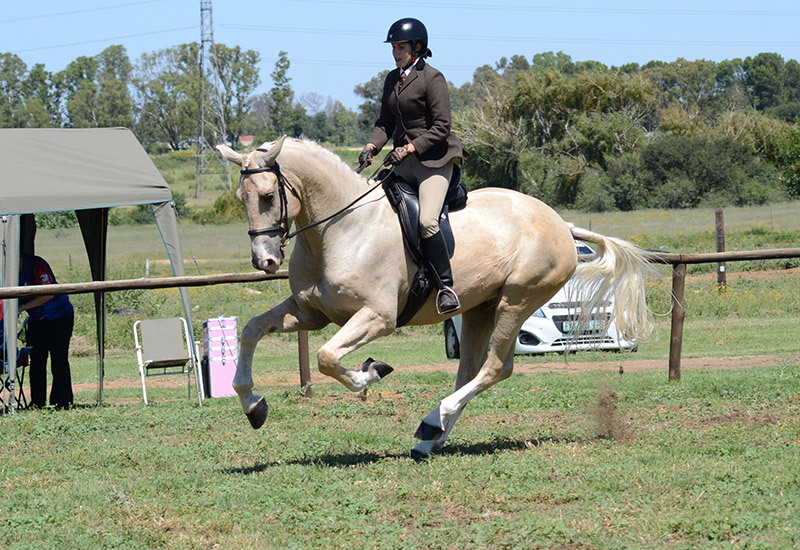 Last weekend, we competed at Gauteng Dressage Champs and we won both our classes and we got pony rider novice champion title. It was both our first musical freestyle test and it was so much fun! And we will be competing at SA youth champs in December. 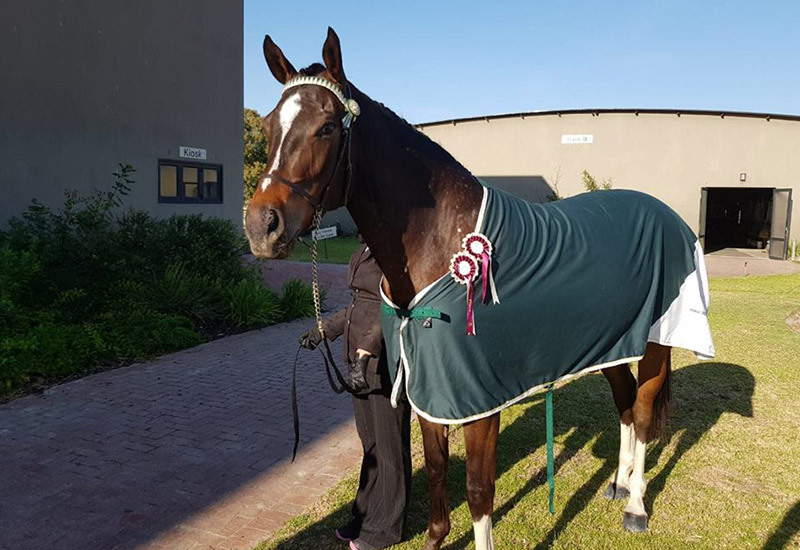 Again: A huge congratulations to our STAR RIDER Zoë Hartley who participated at Gauteng Showing Champs 2018 on Painted Goldrush, and made us incredibly proud, RESERVE CHAMPION for junior horse, and CHAMPION for junior working riding horse! A stud favourite sold to an incredible home at Skyroo stud as a personal riding horse to the lady of the house. 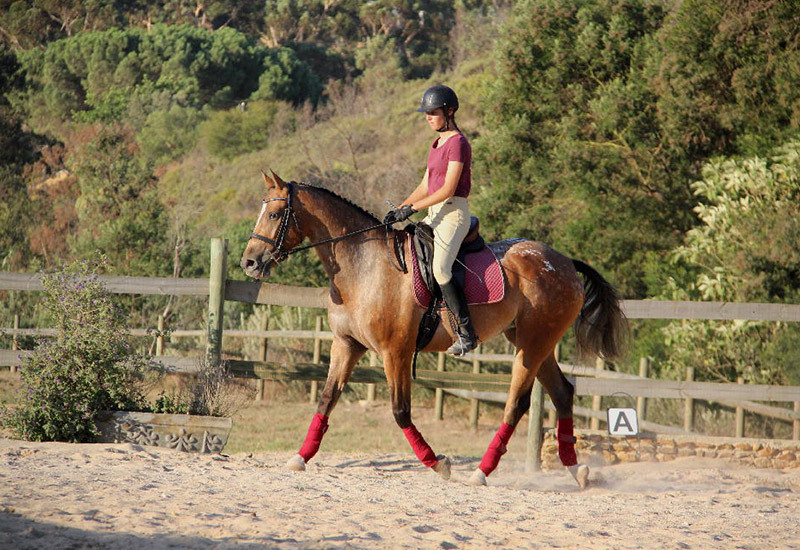 Pearl is truly a pearl …the fun beach rides the fun shows…what an incredible versatile mare with a heart of gold. Valentine produced one foal for us at the stud and did she do us proud. The dam of Painted Hi Andrews Valentine Sparrow. One of our lead mares at stud and if we were granted the chance we would buy Valentine back in a heart beat. 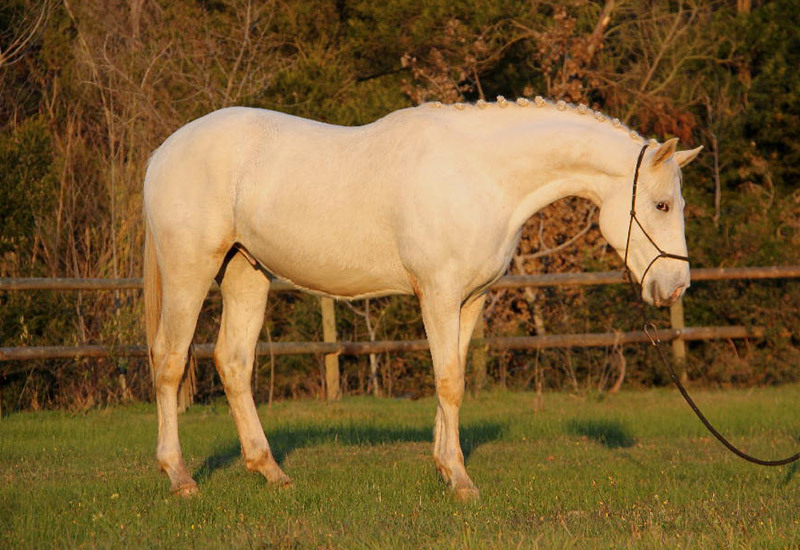 She is an incredible workable mare with extraordinary breeding ability. Sandy was raised at stud with her owner to be the perfect match! Her rider is still enjoying her everyday although they have spread their wings. Fly high our girls. 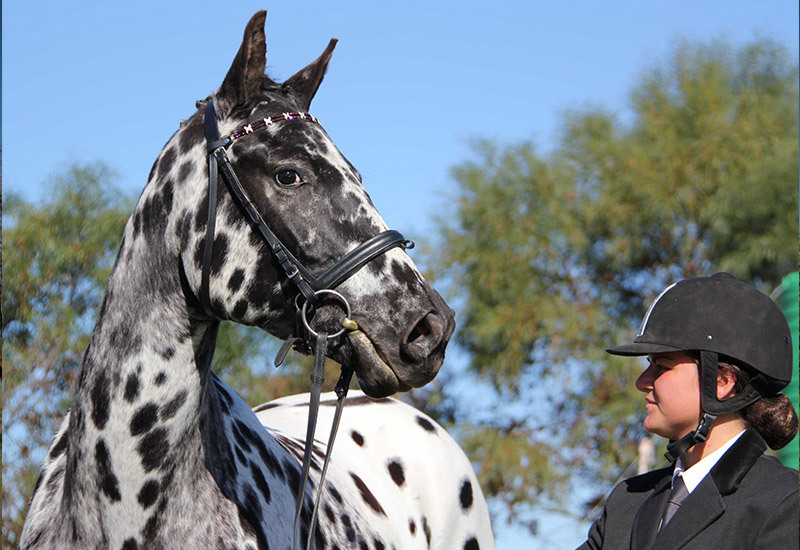 An elegant appaloosa sport horse mare living up country that has been started off in classical dressage, but is since being used as a brood mare by one of the elite sport horse studs in the country. 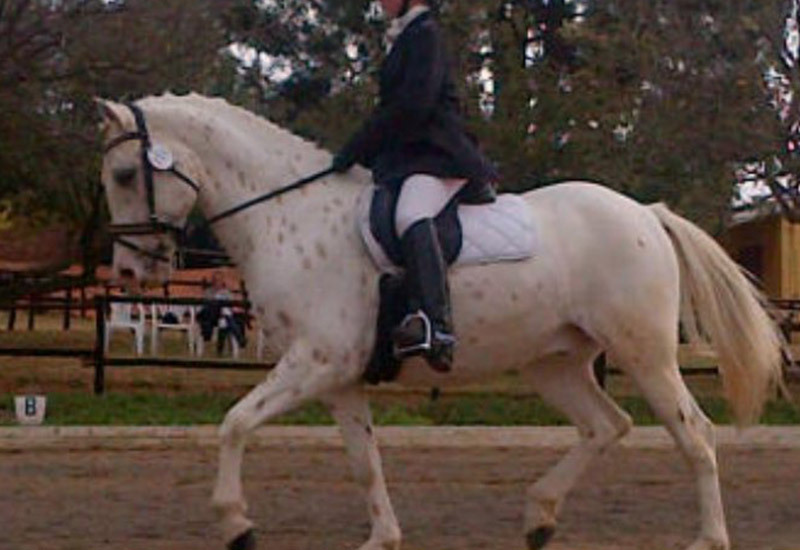 A super elegant tall purebred appaloosa gelding enjoying his life as a personal riding horse up country.